A little while ago, a call went out to all bloggers to write a post related to New Zealand on March 20 2011. The worry is that with much of Christchurch in ruins and a certain moon man predicting more mayhem to come, many tourists may decide to skip NZ as their next holiday destination. So I thought I would do my bit with a post about my favourite place to visit. With me being obsessed with bioluminescence, there are no prizes for guessing that it is Waitomo, home of the NZ glowworm. Actually, I lied. This isn’t a post about Waitomo. It’s a post about Arachnocampa luminosa. Hopefully by the end of the post you will be as keen as I am to visit Waitomo (I recommend the Spellbound tour for really good glowworm viewing) or any of the other places scattered around NZ that glowworms hang out. They like dark, damp places such as caves, on river banks or near streams in dense bush and forests (but also the botanic gardens in Wellington, apparently). Saying that, Waitomo is probably the only place you can admire the glowworms and partake in some adventurous watersports, like black water rafting*, which I highly recommend. So back to Arachnocampa luminosa. Despite the name, glowworms are not worms, but the luminescent larvae of a fungus gnat that belongs to the subfamily Arachnocampinae of the Dipteran family Keroplatidae. Being fly larvae, a better description would be ‘glow-maggot’, but I think you’ll agree that this doesn’t quite have the same ring to it. A. luminosa is only found in NZ but a number of other Arachnocampa species are found in Australia. V. B. Meyer-Rochow has written a very nice review (1) of Arachnocampa in the journal Luminescence but alas it is not open access. The glowworm and its fishing lines (Image from Spellbound). 1. They are carnivorous and catch their prey (mainly flying insects, which can include the adult Arachnocampa flies…) using very fine but extremely strong silk threads covered with droplets of mucus which they dangle from their nest. These ‘fishing lines’ can vary in length from 1 to 50 cm (2). In his review, V. B. Meyer-Rochow says he has found proteins in the mucus droplets that could act as an anaesthetic on the prey (1). A glowworm’s ability to snare prey is due to the instinctive behaviour of almost all ï¬‚ying species of insects to ï¬‚y towards point sources of light. The spots of light emitted by each glowworm must be indicative of open space. The hapless insects ï¬‚y towards the fake sky only to end up stuck to a glowworm thread. And then devoured. 2. Like most insects, the glowworm life cycle has four stages: egg, larva, pupa and adult, and takes about 10-12 months, depending on the temperature, humidity and availability of food (3). 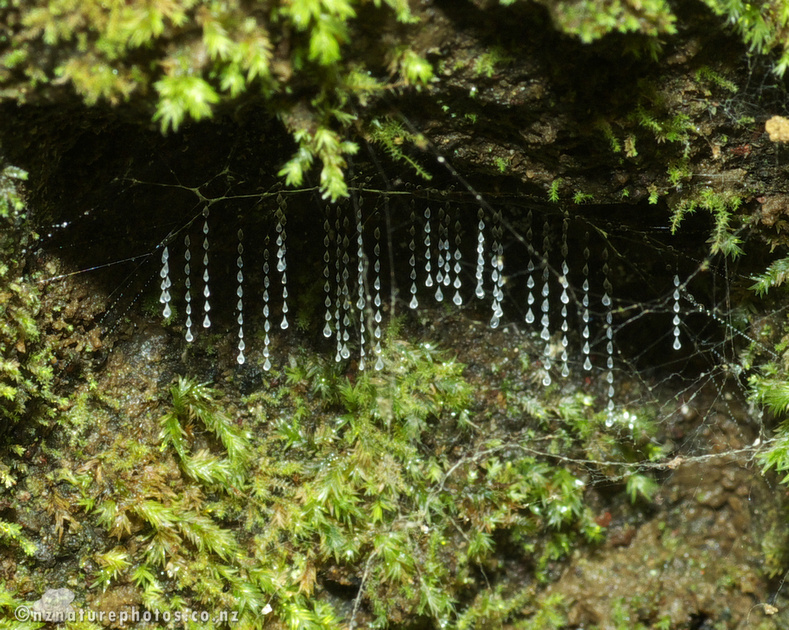 Females lay about 130 (non-glowing) eggs, which in Waitomo hatch in 20—24 days (4). Newly hatched larvae, which only measure a few mm in length, immediately start constructing a nest and fishing lines, and switch on their light to attract their first meal. Glowworms take about 9 months to go through four moults, reaching a length of 30—40 mm, after which they pupate. Pupal development normally takes 12—13 days. 3. Both male and female pupae in A. luminosa are luminescent. However, the male pupae either stop glowing or become very dim in the couple of days before they hatch out, while the females become more bioluminescent. The adult flies have no mouths; their only purpose it to reproduce. As a result, the males live up to 6 days and females on average 2—3 days. 4. Several male flies can be found hanging on to a female pupa waiting for it to hatch. As soon as she starts to emerge, the males will battle it out to mate with her. Because of the competition, they will try and remain in place, mating for as long as they can, which can be for up to 7 hours! As a result, a female only mates once. She then lays her eggs and dies. Males will try and mate with as many females as possible before starving to death, or being caught up in a fishing line and devoured…. 5. Glowworm bioluminescence arises from the oxidation of a substrate (the luciferin) by an enzyme (the luciferase) which, in this case, requires energy (in the form of ATP) and oxygen. Luciferin and luciferase are generic terms as none of the major classes share sequence homology. In Arachnocampa, the light emitted is blue-green, with a peak at 484 nm. Beyond that, not much more is known. But this should soon change with the award of a three year Fellowship to Dr Miriam Sharpe, of the University of Otago, by the former Foundation for Research, Science and Technology (now the Ministry of Science and Innovation). Miriam is trying to purify and clone the proteins involved in the glowworms bioluminescence reaction to determine how they function. Fingers crossed! So there you have it. If you fancy a visit to Waitomo to see the glowworms, drop me a line. My family are sick to death of the place so I’m always looking for someone to go with! * You wedge your arse in a car inner tube and float down the underground river. It’s fantastic. 1. V. B. Meyer-Rochow (2007). 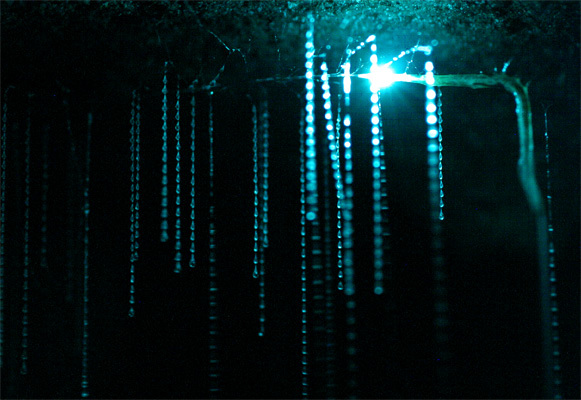 Glowworms: a review of Arachnocampa spp. and kin. Luminescence 22: 251—265. DOI: 10.1002/bio.955. 2. N. Ohba (2002). External morphology and feeding habits of the New Zealand glowworm Arachnocampa luminosa (Diptera:Mycetophilidae). Sci. Rep. Yokosuka City Mus. 49: 13 — 22. [In Japanese]. 3. C. W. Pugsley (1984). Ecology of the New Zealand glowworm, Arachnocampa luminosa (Diptera: Keroplatidae), in the Glowworm Cave, Waitomo. J. R. Soc. N. Z. 14: 387— 407. 4. A. M. Richards (1960). Observations on the New Zealand glowworm Arachnocampa luminosa (Skuse) 1890. Trans. R. Soc. N. Z. 88: 559—574. UPDATE 21/03/2011: Those interested in reading Prof. Meyer-Rochow’s review on Arachnocampa, can contact him through here. Another fantastic place to see glowworms is the Kawiti caves near Waiomio, Northland. Just of SH1 so is an easy detour! If there are some readers of your blog, who wish to obtain a copy of my glowworm review, you can let them have my e-mail address OR refer them to my webpage, from where they will find a way to contact me. I believe you can also see them in Dunedin in a cave up the side of the Leith valley. An easily accessible place to view glowworms is in the Domain in Auckland. After dark they are visible on the clay banks on the east side of the path that heads North from Domain Drive, just to the west of, and parallel with, Lovers Lane. I haven’t been there after dark for a few years, but I assume that they’re still there. Thanks for all the glowworm spotting tips. I’m going to check out the Domain as soon as possible. It would be great if getting my glowworm fix could be done with a short bike ride! Glow spot in Wellington – from Kelburn down Glen Rd take the LH path – it leads through the Botanic Garden past the bottom of the kids playground to the Duckpond near the main entrance. Kahangarake Gorge, Woodstock underground pumphouse. Walk into the short tunnel, into another tunnel to the right and you have them hanging right above your head, and also a ceiling full of them in the actual pumphouse. Hardly anyone there, so total silence in there, switch off the torch – magical!